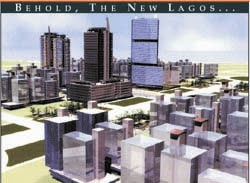 Lagos White Elephant Project Called "Mega City"
I dont know the "afose" or spell Political Jobbers cast on the Lagos State Governor Babatunde Fashola. How can any serious administrator buy the lie called "Lagos Mega City Project"
The project is just another way of syphoning public fund into private pocket. What the Governor need now is provide basic amenties for Lagosians, good and motorable roads, clear the drainage, security, employement and a total transformation of Oshodi, Agege, Iyana Ipaja, Mushin, Ajegunle and other Lagos Slums, not a White Elephant project with the fancy name "mega City"
Che Guevara © Che Guevara was an Argentinean-born, Cuban revolutionary leader who became a left-wing hero. A photograph of him by Alberto Korda became an iconic image of the 20th century. Ernesto Guevara de la Serna, known as Che Guevara, was born on 14 June 1928 in Rosario, Argentina into a middle-class family. He studied medicine at Buenos Aires University and during this time travelled widely in South and Central America. The widespread poverty and oppression he witnessed, fused with his interest in Marxism, convinced him that the only solution to South and Central America's problems was armed revolution. In 1954 he went to Mexico and the following year he met Cuban revolutionary leader Fidel Castro. Guevara joined Castro's '26th July Movement' and played a key role in the eventual success of its guerrilla war against Cuban dictator Fulgencio Batista. Castro overthrew Batista in 1959 and took power in Cuba. From 1959-1961, Guevara was president of the National Bank of Cuba, and then minister of industry. In this position, he travelled the world as an ambassador for Cuba. At home, he carried out plans for land redistribution and the nationalisation of industry. A strong opponent of the United States, he guided the Castro regime towards alignment with the Soviet Union. The Cuban economy faltered as a result of American trade sanctions and unsuccessful reforms. During this difficult time Guevara began to fall out with the other Cuban leaders. He later expressed his desire to spread revolution in other parts of the developing world, and in 1965 Castro announced that Guevara had left Cuba. Guevara then spent several months in Africa, particularly the Congo, attempting to train rebel forces in guerrilla warfare. His efforts failed and in 1966 he secretly returned to Cuba. From Cuba he travelled to Bolivia to lead forces rebelling against the government of René Barrientos Ortuño. With US assistance, the Bolivian army captured Guevara and his remaining fighters. He was executed on 9 October 1967 in the Bolivian village of La Higuera and his body was buried in a secret location. In 1997 his remains were discovered, exhumed and returned to Cuba, where he was reburied. Are You Black? Dont go to Russia! ARE YOU A BLACK MAN? DON'T GO TO RUSSIA! Met Uri Godnav (not real name as he his on the so called top 40 wanted list of the Russian Regime) at the meeting of the anti fascist movement held in Istanbul Turkey. I had just made a presentation on the aspiration of the Yoruba in southwest Nigeria towards self-determination. My presentation centred on my involvement with the Odua people’s congress, the betrayal of the genuine aspiration of the Yoruba. A betrayal by political prostitutes who turned a potential revolutionary organisation into an instrument of oppression and a bargaining organ to negotiate spoils of power from corrupt but articulate Yoruba leaders. These leaders have deceived the people into believing that the faith of the estimated 50 million Yoruba in Nigeria, and more than 25 million in Diaspora, lies in a continued forced union and a turn-by-turn looting agreement by the ethnic nationalities that make up the mirage called Nigeria. Visiting Chechen Republic from the United Kingdom is a tough task, my contact assured me I will never get a visa from the Russian embassy in London if I indicate my visit was for onward transition to Chechnya, not bothering to ask if the Chechen Republic do have an embassy he promised that a contact will call my house in London and that our journey to Chechen would be trough unofficial route (can't explain any further here remember the Nigerian NADECO route?) Each time I got ready for the trip something gets in the way, the last one was the reported killing of Aslan Maskhadov by Russian forces. Aslan was seen as the Yassar Arafat of the people of Chechen. These last Easter Thursday I was just about telling my colleagues at work here in London that I would be having a very well deserved rest in Paris when a call came trough that "the road is clear" and so it was that I finally made my trip to Chechnya, land of Europe's longest-running but most brutal war. The story of what I saw in Chechnya is for another day. But even when we condemn the terrible terrorist activity going on in Chechnya, the world should not forget and turn a blind eye on the brutal use of power by the Russian govt on the innocent and unharmed women and children of Chechnya. My trip has also espoused me to a bitter truth the state of the self-determination group in Nigeria is nothing but a big joke. Its nothing but an avenue for otherwise jobless lazy local warlords to experiment self determination in a highly disorganised fashion leading to senseless killings and turning terror on the people under the banner of internal fights and struggle over money dolled out by the federal, state and local governments and politicians who find it necessary to control any mad man with a shakabula (Dane gun) or some amount of AK47. The final leg of my journey took me to Moscow and meeting members of the African students union was an eye-opener. It is a shame that the Russian government is turning a blind eye on the growing level of attacks on foreign students and residents in Russia. Students of the International University in Moscow are the worst victims. I was shown video evidence of acid attacks and knife cuts. One African student, Nigerian Mukaila Odedina remains paralysed from an attack from right wing thugs in front of a Russian police station in Moscow. Speaking with Mukaila brought tears to my eyes. He is in his final year and would have been a medical doctor in September 2005. Now, he cannot even raise a flight ticket back home. All contact with the Nigerian embassy yielded no result. I still maintain that religion is becoming part and parcel of the problem we have in Nigeria. False hope, a departure from the theme of salvation to prosperity, the partnership between Pastors, Imams and other religious leaders with the corrupt people in government and the inability of this same group to speak truth to power is such a shame. We do have the highest growth in Christianity and Islam in the world nonetheless remains one of the most corrupt countries in the world. It is high time we start probing the finances of those who hide under the banner of religion to steal and deceive the people. A Pastor in the Redeemed Christian Church of God (RCCG), Joseph Itegbe, was on Tuesday arraigned at Tapa Magistrate’s Court in Lagos for allegedly stealing N5.7 million tithe belonging to the church. Police prosecutor, S. Malo, said between January 2006 and January 2007 Itegbe conspired with others (now at large) to steal a First Bank of Nigeria draft valued N2,360,000 being tithe of church members in The Master Place Province 8, in Gbagada, Lagos. He told the court that Itegbe stole another First Bank draft valued N3,200,00 as well as a cheque worth N130,000. Itegbe also allegedly forged a letter purportedly written by the church to the bank manager. He pleaded not guilty to all the charges, and was granted bail in the sum of N500,000 with two sureties in like sum. Magistrate Osho Adebiyi adjourned the matter till February 25. In another case, Magistrate J.O. Awope of Tapa Magistrate’s Court remanded three suspected pipeline vandals in prison custody. The accused persons were said to have on December 24 last year in Alakija, Lagos conspired to commit felony, to wit: malicious breaking of the pipeline of the Nigerian National Petroleum Corporation (NNPC) in the area. With a population made up of more than 250 different ethnic groups and a strong sense of regional as well as ethnic identity, Nigeria has seen the emergence of numerous self-determination groups. These groups have advocated various forms of autonomy on an ethnic or regional basis, within or outside the current federal structure of the country. Several of them, for example Yoruba groups in the southwest, Igbo groups in the southeast, and Ijaw and other groups in the oil-producing delta in the south, have been very vocal in articulating their demands for autonomy, based on claims of marginalization within the current political system; some but not all have used violence. In the last few years, an umbrella organization for Yoruba self-determination groups, the Coalition of O’odua Self-Determination Groups (COSEG), has not only brought together the various Yoruba organizations, but has also made overtures to self-determination groups of other ethnicities and regions of Nigeria which, while representing different interests, are united in their opposition to the current federal structure, and hence the federal government, of Nigeria. In February 2003, Human Rights Watch published a report on the O’odua People’s Congress (OPC), one of several Yoruba self-determination groups active in the southwest of Nigeria. The report described cases of extrajudicial killings and other abuses suffered by OPC members at the hands of the police, as well as numerous killings and other acts of violence by the OPC.71 Since the publication of that report, incidents of violence by and against the OPC have decreased, as its leaders appear to have reached a kind of peace or compromise with the federal government. However, there have been cases of extrajudicial killings, arrests and other forms of harassment of members of other self-determination groups. In May 2003, Kayode Ogundamisi, a well-known activist in Nigeria, president of the O’odua Republic Front (ORF, a more recently-established Yoruba group) and former National Secretary of the OPC, was arrested by members of the SSS and detained for two weeks. He was denied contact with his family and lawyer throughout his detention. After two weeks, he was released without charge. During his detention, he was questioned repeatedly about his political activities and those of his organization, the ORF, and he was told he should join the political mainstream. From the interrogation, it would appear that the arrest may have been linked in part to a newspaper advertisement by the ORF published in the Lagos-based Punch newspaper a month earlier, on April 5, 2003. In the advertisement, the ORF called for a campaign for a sovereign national conference, a referendum on an Oodua republic72 and a campaign for a free southwest. Wale Adedoye, a journalist from The Punch, who was with him at the time of the arrest, was also arrested but released after a few hours. When I arrived at the British Airways desk at Lagos airport, about seven SSS men came straight up to me. They had obviously been waiting for me. They told me to go with them. I asked why and they pulled out their guns […] They said they had orders from above not to let me travel. They took my ticket and passport and told me to write a statement. I refused. Then they picked up Wale, in front of his wife and children. They escorted me and Wale out through the back door. They put us in two station wagons, separately. Other armed SSS were waiting outside. At about 2 p.m., they drove us to Shangisha, the Lagos State SSS headquarters. No one had told me why I was arrested. The Lagos State director of the SSS came and told me: “You’re giving us problems.” He was very angry […] The next morning, the deputy director said I should write a statement. I refused. They gave me a form of about thirty pages, very detailed, and asked me to fill it in. They had not allowed me to make any phone-calls. I asked if I could call my PA about my luggage [which had been left at the airport]. They said yes but I could only ask one question. They told her to bring the luggage to me. Before that, they said they wanted to do a search of the hotel where I had stayed. We went together in a station wagon, on Monday at about 10.30; they were all armed. They stopped at Ikeja High Court to get a warrant. The magistrate refused to give the search warrant as he said there was no reason. They drove to another court in Agege. The magistrate there refused too. Eventually they abandoned the idea of searching the hotel. They drove back to Shangisha. My PA was there but they didn’t let me talk to her. They searched my two bags. They took out the letterhead paper of the ORF, some COSEG campaign materials and the Human Rights Watch report on the OPC. They made me sign a paper that they had taken those materials. They refused to let me call my lawyer as they kept telling me I would be released very soon, the next day. They said they had told my PA to pick me up on Tuesday. They still hadn’t said anything about why I had been arrested. At about 6 p.m., I decided to write my statement. I wrote that I was protesting about what had happened and lodged an objection. The director said this was not necessary. He said the orders for the arrest had come from Abuja, not from Lagos. They asked me to account for what I had done in the last ten years. They took out my passport and went through it country by country […] The questioning lasted about five hours. On Tuesday, they took me back to the HQ for interrogation. There was a team of six people. They said to me: “Where did you keep the arms? We know you have three container loads shipped into the country.” They said I should show them where the arms were. I said I didn’t have any and we don’t believe in using arms. He said: “You’re finished” and “The ORF won’t see the light of day.” I gave them my lawyer’s number but they refused to call him. On Wednesday I said I wanted to write a protest letter to the director and that they should charge me or let me go. I asked if they could at least let me call my family. They refused and said they had to seek approval from above. On Thursday they questioned me about the advert in The Punch. They asked me why we made extreme demands and what we meant by Yoruba should campaign for an independent nation […] That was the last interrogation until I was released on the evening Monday 26 May. On Monday morning, they came to get me from my cell […] I was taken to the national director of the SSS for the first time […] He had a big file with my name on it: “Kayode Ogundamisi, leader ORF.” He said: “Forget it, the case is over. What you’ve done is not illegal but it could destabilise the country and it could provoke northerners. I’ve told them to release you. Stop these articles you’re writing. Watch what you say against this government. Obasanjo is a Yoruba man. You should be cooperative with the government.” He never apologized. It was as if my release was a favour. Although MASSOB does not appear to enjoy the kind of massive popular support which would represent a serious political threat to the government, MASSOB members have been persistently harassed by the police, acting on orders from the federal government. The clashes between MASSOB and the police are reminiscent of those between the OPC and the police,77 with the police raiding MASSOB premises and its leader Ralph Uwazuruike’s house on several occasions in 2000 and 2001. "My experience in the hands of the German Security agents, I must confess is a departure from my experience in the hands of security agents in Nigeria. The Germans were very friendly and the interrogation was done professionally and in a friendly atmosphere." hose were the words of Mr. Kayode Ogundamisi, the Secretary General of the Oodua Peoples Congress, OPC, in an exclusive interview with The Guardian yesterday-on Thursday about his experience with German security agents who probed him for three hours on Wednesday on his relationship with OPC. The Germans told him they were informed by a US group, Federation of American Scientists, FAS, that OPC is a terrorist group. FAS also listed Egbesu Boys, Ijaw Youth Congress and the Ijaw National Congress in the same category. Although the OPC official said they conducted a background check on him and concluded he was ok, he believed that they would still most probably still put him under surveillance. "They said I was OK, but I am sure I will be on their surveillance." But the OPC functionary said, "the way they tried to destroy NADECO is what they are now doing to the OPC, Egbesu Boys, Ijaw Youth and some other organisations. I remain steadfast and committed; they are strengthening my resolve to fight on. This indicates that we are making a headway." Ogundamisi, who is based in Dusseldorf said it all began on Sunday on his way back from London, when German Immigration were attracted by the fact that "I have traveled to over seven countries in three months. And I told them I have been involved in campaign against anti-immigration policies in Europe." By Monday the security visited Ogundamisi's house and invited him over to their offices for interrogation on Wednesday. Ogundamisi, who was also an official of NANS in his student days in Nigeria, said the four Germans who probed him came from the anti-terrorist unit of the nation's Department of Internal Security. "They asked me about my activities from Nigerian the past and I told them that I have been peacefully involved in self determination campaign for the Yorubas in Nigeria." According to Ogundamisi, the Germans told him the Nigerian Intelligence Agency tipped them off about him. "They said the NIA said I have been mobilising for arms and ammunition. But I denied this and explained to them that such baseless allegations are mere attempts to maliciously cast the activities of the OPC." He said they also informed him that the Federation of American Scientists' report listing OPC among terrorist groups was actually the real report that spurred them to ask him down for the interrogation. But by yesterday- -Thursday- Ogundamisi had to return again to the office of the German anti-terrorist unit, and he was accordingly given a clean bill of health. "I just came from Bundes office today, I had to report again today. But I would not be going back again since they have given me a final clearance this morning." In recent times, the German government has been clamping down on activists groups in the country, including those seeking self-determination like OPC. Infact Ogundamisi said the agents linked him with Egbesu Boys, Ijaw National Congress and Ijaw Youths Congress, all included in the list of terrorist groups named under FAS's guide list. He said he did not deny the link, but explained that the groups were all non-violence but only fighting for self-determination. He was also asked what was the relationship between the OPC and the Egbe Omo Yoruba of the USA and Canada. Dwelling more on the details of the questioning, Ogundamisi said they asked him about charges proffered against him by the Babangida military government over the allegation that he was among the organisers of the SAP riots and also about the formation and the history of the OPC. He said he explained that under the IBB regime, he was arrested unduly under DN2 and was never convicted. "I also explained to them that OPC is a self-determination group. I told them I have always campaigned peacefully and have never been involved in violence. I also directed them to their embassy in Nigeria for information about the formation of OPC," Ogundamisi said during the telephone interview. He added that in fact the OPC has since been silent, stressing that it was a strategic decision to allow for peace in the country. They also asked him about the 2003 elections. His reply: "I told them elections are not the real issues in Nigeria, but the issue is about the right of ethnic groups to self determination." Commenting further Ogundamisi said he loved Nigeria, but that does not stop him from championing the interests of the Yoruba people. He said his interrogation was motivated by people who wanted to "malign my name internationally, because we have been receiving invitations all over Europe, so I envisage that these are moves to destroy OPC internationally." He said there are 5th columnists in Nigerian embassies "trying to cause trouble for some of us." For instance he said sometimes in Kenya after the restoration of civil rule, "Nigeria's military attaché in that country told the Kenyans that I was wanted in Nigeria. That was when Dr. Fasheun was arrested." Since the incident on Wednesday, Ogundamisi said he has been receiving several calls and has been assuring all his callers that he is OK and fine. "I want to tell all our members at home to remain calm and committed." After loads of push from friends and foe alike that I should start a blog it! Took time to get into the blogging world. But here I am its the 29th day of January 2008 and I find myself blogging.